Theater-goers cannot live by Indigo alone. As wonderful as it may be for a pre- or post-performance meal, there are only so many wontons one can ingest before longing for one more option. Now that the mad season has begun, traffic makes it even more important to arrive early to reserve a parking spot, making dining downtown a must -- yes, even for the most sheltered of you, still 'fraid of street life after dark. Fret no more, the newly opened Spada Bar & Restaurant offers a clean, contemporary environment, and it has the First Hawaiian Bank's stamp of approval, having opened on the ground floor of FHB's main branch, where Sbarro earlier served up pizzas. Foodies will yawn over the carb-laden menu, but this place is bound to be popular with the theater crowd, First Friday art enthusiasts --the monthly art walk takes place again 5 to 9 p.m. Friday -- and the daily pau hana crush. The food's basic but varied and the location most convenient. It gets pretty noisy here. Inside, you'll deal with the roar of a crowd. Outside, your voice will compete with a waterfall. Try not to fall in. Consider this fair warning because the restaurant does have a lengthy martini menu. Alredo Lee, one of the chefs at Spada, is busy cooking for the lunch crowd. 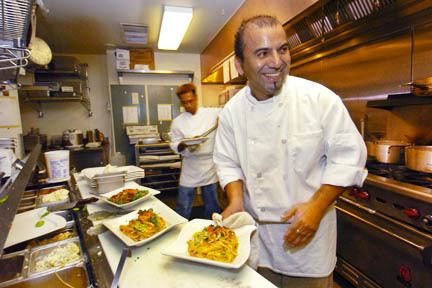 Behind him TJ Calapini plates a dish. THERE WAS some hype preceding the restaurant's opening, due to chef Faz Poursohi's Bay Area successes, but it doesn't take a lot of cred to fill a menu with pastas and flatbread. The latter greets you from the moment you sit down, reappearing later as pizzas and piadini (sandwiches). Accompanying the first batch of flatbread is the traditional blend of balsamic vinegar and olive oil, pumped up here with pesto and Parmigiano-Romano cheese. You'll double your bread intake if you order a starter of steamed clams ($8.95) with its attendant broth of white wine, garlic and basil that must be sopped up. After this round of flatbread, I'd really think twice about ordering a pizza or piadine, but it is their specialty after all, so it was my fate. A pizza seemed like overkill at this point, so, per our server's recommendation -- never listen to them if they're younger than 28 -- I opted for the sandwich of smoked salmon ($10.95), capers, onions and dill sauce, only to find it might as well be a pizza, because that's what arrived. It's the diner's job to take the slices and roll or fold before digging in. Which tasted fine and is especially handy for busy types forced to walk and eat during their lunch minute, although when I think of a sandwich, I think of extras of greens and maybe a bit of tomato folded in. As a sandwich, this pizza seemed a little sparse. You'd probably do better with the vegetarian ($9.95) option of grilled vegetables or chicken Caesar ($9.95). 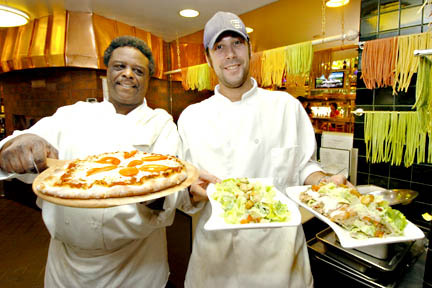 Chef Rick Hadnot holds a freshly baked pizza while pastry chef Mike Green holds a Caesar salad and a warm chicken salad. Hanging behind them is freshly made pasta set out to dry. EVEN IF YOU hit upon dishes that miss, finicky types are still likely to find a couple that are palatable enough for a return date on theater outings. Keep it simple with tuna carpaccio ($8.95) served on a bed of greens, though not arugula as the menu mentions. Ceviche ($7.95), was also served without the advertised arugula. Servers should be informing diners when such substitutions are made. It probably wouldn't deter anyone from placing the order, but arugula is quite different from an assortment of lettuces. The ceviche will also challenge your perception of what the dish is all about. Here, a whole fillet is plopped upon said salad, with citrusy flavors that are diluted, but certainly passable. Those who insist on having it all, however, will miss the aesthetic of having their fish nicely cubed and lightly tossed with a pretty relish of fruits, onion and cilantro. More carbs arrive with the pasta menu including cheese ravioli ($9.95), cannelloni stuffed with ricotta, spinach, pine nuts and cheese ($10.95). Fettuccine Marco Polo ($13.95) is topped with sweet shrimp tossed with diced Hauula tomatoes and a few spinach leaves in what is said to be light, but I deem heavy, cream sauce with a hint of yellow curry. A lamb shank ($15.95) was cooked dry. The best thing about it was a few flecks of sun-dried tomatoes. On the other hand, Pesci di Spada ($16.95), swordfish lightly seasoned with salt and pepper and steamed with bok choy and fennel, was cooked perfectly. Those who go for heavy sauces will think this dish too sparse, but the fennel, an under-utilized veggie, was quite enough to infuse the fish with a light licorice flavor. For dessert, you must try the house tiramisu ($5.95), which makes me fear for bank employees, who may grow fat on this addictive combination of lady fingers, espresso, frangelico, mascarpone and cream. See some past restaurant reviews in the Columnists section.